Deep in the South Caribbean near South America lay the ABC Islands of Aruba, Bonaire and Curacao. All three are ruled by the Netherlands and have rich history to go along with beautiful island breezes, beaches and many varied activities. As a stop on many Caribbean cruises, Aruba’s tourism enjoys over 1,000,000 visitors a year to the island. 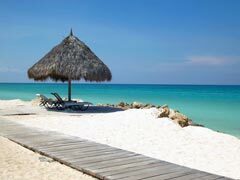 Travelers to Aruba can enjoy the casinos, the miles of sandy beaches and the chance to scuba dive amid shipwrecks and off shore reefs aplenty. There are also many sailing opportunities on catamarans, teak schooners or yachts and trips out to deep sea fish, while on land, horseback riding on the beach, windsurfing or kite surfing beckon the Aruban traveler. Aruba tourism also includes a selection of museums and places of interest, like the Fort Zoutman and Willem III Tower. The museum is housed in the oldest building in all of Aruba, and has a vast collection of artifacts from the Spanish and Dutch historical roots to the island. Aruba travelers can also see the Archaeological Museum, with its five rooms devoted to interesting finds, artifacts, pottery, tools and art. Aruba travelers may also like something different in the form of the Ostrich Farm, where 80 of these massive birds live, or if butterflies are more you style, there is a Butterfly Farm that an indoor oasis of flowers and plants and of course thousands of butterflies call home. The Casibari Rock formation makes an interesting attraction for Aruba’s tourists to see as it seems to rise out of the desert sand making interesting shapes and forms. There is a walking trail and lookout points offering lovely views of the island there as well. For those who like to explore, the Quadiriki Caves prove interesting. See native Arawak petroglyphs, many deep passages and dripping stones deep under the ground, and if you don’t have a flashlight, don’t worry, you can rent one when you get there. 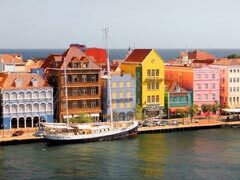 Aruba tourism isn’t the only thing on offer in this three island cluster, as to the east of Aruba lies the island of Curacao. Curacao’s tourists enjoy the many caves and limestone cliffs, along with all the water sports, bike rentals, golf and deep sea fishing one can handle. Just 10 km from Curacao is Klein Curacao, a deserted island paradise that you can easily get to with Mermaid Boat tours. This island is a mecca for scuba diving as it offers vertical drops, underwater caves and shipwrecks to explore and is also a great place for snorkelling amid the reefs and coral formations. Curacao’s tourism extends to this island that is quiet and secluded yet offers beach huts, rubber boat rafting and plenty of trails and corners to explore. The Dolphin Academy offers tourists to Curacao plenty of opportunity to interact with these graceful creatures in many different encounters as well as education and training courses. From swimming with them in enclosed lagoons, to scuba diving in the open sea to learning how they are trained in three day “schools” this academy has it all. For those tourists to Curacao who would like to take in the history and culture of the island on dry land, The Curacao Museum in Otrobanda will definitely fit the bill. Housed in a historic building circa 1853, this museum has works of art, antique furniture, maps and Indian art on display. The Maritime Museum of Curacao offers vacationers an interesting view into the shipping history of this island nation, all housed in a mansion built in 1729. The inside has been refurbished to resemble a ship with port holes, lots of wood, brass railings and even a gang plank. Antiquated charts, maps and many miniature ships are on display and the museum also operates a ferry that gives tours of the harbor as well as transporting cruise ship passengers to and from the museum itself. Bonaire tourism is more for the traveler who likes a slower pace in natural surroundings than the hustle and bustle of the major tourist destinations. 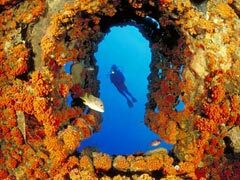 Most of the travelers to this lovely island come for the scuba diving sites that have been rated as one of the top 3 places to dive in the world. Bonaire was among the leaders in the eco-friendly movement and they have a strict no touching policy in the Bonaire Marine Park where you can explore reefs, various fish and turtles on your travels. Washington-Slagbaai National Park is a mecca for birders and hikers alike, and over in Lac Bay, Bonaire’s tourists can enjoy windsurfing with constant ocean breezes coupled with shallow still waters. For the best bonefish fishing in the world, look no further than Bonaire; its tourists enjoy the peaceful surroundings while being treated to some of the best deep sea fishing spots in the world. They also have a museum or two to explore on the island, including the Bonaire Museum which is located in a 110 year old plantation house. Here visitors can take a look back in time to how the plantation was run as well as the history of the island. For a laid back vacation with the surrounding natural beauty as the main focus, Bonaire is a lovely getaway amid the colourful Caribbean.